Organised to coincide with Mercedes-Benz’s 125-year anniversary, the exhibition »WerkStadt Dialog« (Factory/City Dialogue) provides a glimpse over the factory wall – right in the middle of the city of Sindelfingen. A former bank was converted to create this new exhibition space, which now also features a majestic staircase. Spectacular large-scale exhibits fill the street-level display windows. Inside, visitors are greeted by a series of monitors showing Sindelfingen plant employees, inviting them to join the dialogue. Around 70 men and women were interviewed to create these engaging video clips, which provide personal insights into a variety of topics relating to automotive construction. The »Wissensband« (Knowledge Wall) is a continuous series of wall-mounted display cabinets that seamlessly combines both exhibition levels. It presents a wide range of information in an anecdotal and playful manner, using text, photographs, drawings and exhibits. The chronological »Geschichtsband« (History Wall) demonstrates how the history of the city and the factory are intimately bound. This history comes to life with the aid of a sliding monitor that allows visitors to select text, photos and videos. 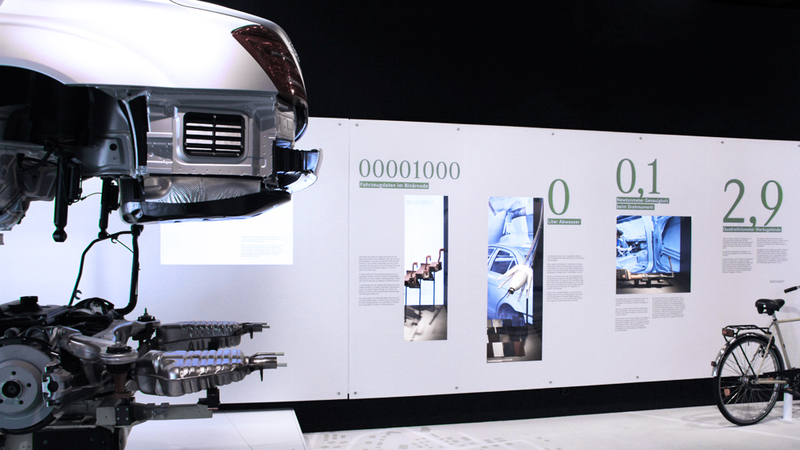 In »Werkspanorama« (Factory Panorama), visitors can immerse themselves in the world of the Sindelfingen plant. The 360° display delivers a very special kind of cinematic experience: you can literally stand in the middle of the production process and can watch the employees in action.